With the completion of the inpatient wing, Wake Forest Baptist Health – Davie Medical Center today kept a promise it made to the residents of Davie County a long time ago. Terry Bralley, President of the Davie County Economic Development Commission, thanked the citizens of Davie County for their support as well as patience and trust in the leadership throughout the process. The three-story, 78,220-square-foot addition officially opens Monday, April 3, and will consolidate all Davie Medical Center services into one location. The hospital in Mocksville was decommissioned last week. In addition to 50 general medical-surgical beds, the new $47 million wing offers an inpatient pharmacy, a chapel, a cafe, rehabilitation facilities, offices for Wake Forest Baptist physicians, therapists and staff. It also has a history wall that honors the past with key keepsakes, photographs and video memories of the first Davie County Hospital over its more than 60 years of providing care to county residents. The inpatient services, uniquely fitted to serve the growing community, are located across three floors of the new facility. Joint replacement program. 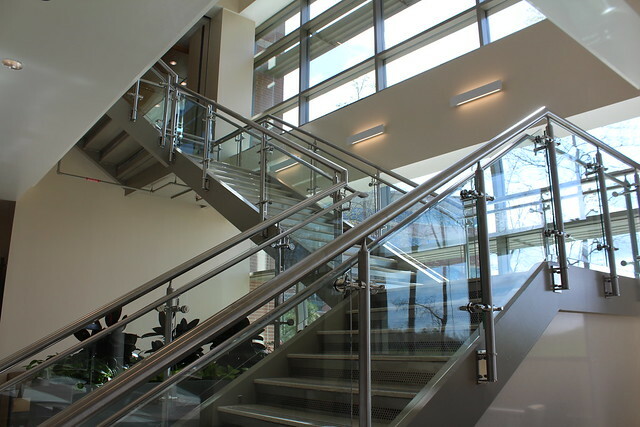 The top floor is dedicated to the joint replacement program, which offers inpatient hip- and knee-replacement surgeries. Some of the room designs include lifts to help safely move patients to and from the bed. The floor also features an inpatient rehabilitation gym to aid in recovery. ACE unit. The first floor of the inpatient addition houses an acute care for the elderly (ACE) unit. The ACE unit creates a care destination for geriatric patients and leverages Wake Forest Baptist’s 25 years of experience in geriatric practice and faculty research. The Davie Medical Center ACE unit will expand the capacity of Wake Forest Medical Center’s internationally known J. Paul Sticht Center. The first floor also will have designated medical-surgical beds that allow medical and surgical admissions from the hospital’s emergency department as well as offer an option for those living nearby to receive care close to home when appropriate. All patient rooms are private and large enough for family members to stay with their loved one. Each room is equipped with convertible furniture that can be used as a bed, couch, or a work station with plugs for electronics. The GetWellNetwork, an interactive video system which offers video education, ways to communicate with and recognized hospital staff, television, internet access, on-demand movies, and games, will be available in patient rooms. This new technology supports the Medical Center’s commitment to patient- and family-centered care by encouraging collaboration between patients, families and health care teams.